The aim of our study is to determine circulating fibroblast growth factor (FGF21) levels in obese and diabetic db/db mice, and role of serotonin (5-HT) in the regulation of hepatic FGF21 expression and circulating FGF21 levels in relation to hepatic gluconeogenesis in obese and diabetic db/db mice. Plasma FGF21 levels and expression of hepatic FGF21 were significantly decreased in obese and diabetic db/db mice compared with age-matched C57BL6J mice. Treatment with p-chlorophenylalanine (PCPA), a tryptophan hydroxylase inhibitor, for 3 days significantly increased plasma FGF21 levels, and decreased body weight and hyperglycemia in db/db mice while having no significant effect on plasma insulin levels. In addition, treatment with PCPA significantly increased expression of hepatic FGF21 and decreased expression of hepatic nuclear factor (erythroid-derived 2)-like 2 (Nrf2) in db/db mice, while having no significant effects on expression of hepatic peroxisome proliferator-activated receptor (PPAR) α, PPAR γ, and activating transcription factor 4. Moreover, treatment with PCPA significantly decreased phosphoenolpyruvate carboxykinase, glucose 6-phosphatase, fructose 1,6-bisphosphate1, Nur77, forkhead box protein O1 and peroxisome proliferatoractivated receptor γ coactivator-1α, which are involved in hepatic gluconeogenesis, in db/db mice. These findings suggest that hepatic FGF21 production is decreased in db/db mice, and that a tryptophan hydroxylase inhibitor increases expression of hepatic FGF21 production and decreases hepatic gluconeogenesis and hyperglycemia independently of insulin in db/db mice. Fibroblast growth factor 21 (FGF21) is primarily secreted by the liver as an endocrine hormone . Circulating FGF21 is elevated in fasted state , mice fed a high-fat diet, ob/ob mice [2-4], and obese humans . Because mice lacking FGF21 fed a high-fat diet enhances insulin resistance , FGF21 is suggested as an insulin sensitizer. Peroxisome proliferator-activated receptor (PPAR) α, PPAR γ, activating transcription factor 4 (ATF4), and nuclear factor (erythroidderived 2)-like 2 (Nrf2) are transcriptional factors of FGF21 in the liver [6-10]. Tryptophan hydroxylase (Tph) is the initial and rate-limiting enzyme in the synthesis of serotonin (5-HT). Systemic administration of p-chlorophenylalanine (PCPA), a Tph inhibitor, remarkably decreases serum and brain 5-HT levels in mice [11,12] and prevents obesity and impaired glucose tolerance in mice fed a highfat diet . Circulating FGF21 levels in type 2 diabetic mice and the effect of a Tph inhibitor on hepatic FGF21 production and gluconeogenesis in type 2 diabetic mice, however, remains unclear. To determine hepatic FGF21 production in type 2 diabetic mice, we examined plasma FGF21 levels and hepatic FGF21 expression in db/db mice with impaired leptin receptors compared with C57BL6J mice matched for age. To determine the role of 5-HT in the regulation of hepatic gluconeogenesis and FGF21 production in type 2 diabetic mice, we examined the effects of treatment with PCPA on food intake, body weight, blood glucose, plasma FGF21 and insulin levels, expression of hepatic genes involved in gluconeogenesis, and expression of hepatic FGF21 and the transcriptional factors of FGF21 in db/db mice. Six-week-old male db/db mice and C57BL6J mice were purchased from Japan CLEA. The mice were individually housed in cages with free access to water and chow pellets in a lightand temperature-controlled environment (12 h on/12 h off, lights on at 08:00; 20°C -22°C). 9-week-old db/db mice and C57BL6J mice were decapitated and blood was obtained for the measurement of plasma FGF21 levels. The liver was excluded for determining mRNA levels. Then, the 9-week-old mice were intraperitoneally injected with saline or PCPA (500 mg/kg) once daily for 3 days. Daily food intake and body weight changes were determined. At the fourth day, the animals were decapitated and blood was obtained for the measurement of blood glucose, plasma FGF21 and insulin levels. The liver was excluded for determining mRNA levels. The experiment was performed between 9:00- 12:00. PCPA was purchased from Sigma Chemical Co., Japan. The PCPA was suspended in 0.2 ml 1% Tween saline. The dose of PCPA (500 mg/kg) was selected based on evidences that treatment with PCPA for 3 days remarkably decreased brain 5-HT and serum 5-HT levels in mice [11,12]. Whole blood was mixed with EDTA-2Na (2 mg/ ml) and aprotinin (500 kIU/ml) to determine the plasma levels of FGF21. Plasma levels of FGF21 and insulin were measured by an enzyme-linked immunosorbent assay (rat/mouse FGF21 ELISA kits; R&D System, Tokyo, Japan, mouse Insulin ELISA KIT (TMB) (AKRIN-011T, Shibayagi, Gunma, Japan) as described previously [14,15]. Blood glucose levels were measured using glucose strips (blood glucose monitoring system; Accu- Check, Roche Diagnostics, Tokyo, Japan). The animal studies were conducted in accordance with the institutional guidelines for animal experiments at the Tohoku University Graduate School of Medicine. Total RNA was isolated from mouse liver using the RNeasy Midi kit (Qiagen, Hilden, Germany) according to the manufacturer’s instructions. cDNA synthesis was performed using a Super Script III First-Strand Synthesis System for RTPCR Kit (Invitrogen, Rockville, MD) with 1 μg total RNA. cDNA synthesized from total RNA was evaluated in a real-time PCR quantitative system (LightCycler Nano Instrument Roche Diagnostics, Mannheim, Germany). The primers used were listed in Table 1. Table 1: The primers used for real-time RT-PCR. The relative amount of mRNA was calculated using β-actin mRNA as the invariant control. Data are shown as fold-change of the mean value of the control group, which received saline as described previously [14,15]. Data are presented as mean ± SEM (n=6). Comparisons between two groups were performed using Student’s t-test. A P value of less than 0.05 was considered statistically significant. Comparisons between more than two groups were performed using analysis of variance with Bonferroni’s correction for multiple comparisons. Plasma FGF21 levels (Figure 1A) and hepatic FGF21 expression (Figure 1B) was significantly decreased in db/db mice compared with agematched C57BL6J mice. Intraperitoneal injection of PCPA (500 mg/ kg) for 3 days significantly decreased daily food intake (Figure 2A), body weight (Figure 2B) and blood glucose (Figure 2C) compared with saline controls in db/db mice while having no significant effect on plasma insulin levels (Figure 2D). On the other hand, intraperitoneal injection of PCPA (500 mg/kg) for 3 days significantly increased and plasma FGF21 levels compared with saline controls in db/db mice (Figure 2E). Intraperitoneal injection of PCPA (500 mg/kg) for 3 days had no significant effects on daily food intake, body weight changes, plasma FGF21 levels and expression of hepatic FGF21 in C57BL6J mice (data not shown). Figure 2: Effects of intraperitoneal injection of PCPA (500 mg/kg) or 1% Tween in saline on daily food intake (A), body weight changes (B), blood glucose levels (C), plasma insulin (D), and FGF21 (E) levels in 9-wk old db/db mice. Basal body weights were 39.1 ± 1.6 g (controls) and 38.8 ± 1.5 g (PCPA-treated group) in db/db mice. Data are presented as the mean ± SEM (n=6/group). *P<0.05. Treatment with PCPA for 3 days significantly decreased phosphoenolpyruvate carboxykinase (PEPCK), glucose 6-phosphatase (G6Pase), fructose 1,6-bisphosphate1 (Fbp1), Nur77, forkhead box protein O1 (FoxO1) and peroxisome proliferator-activated receptor γ coactivator-1α (PGC1α which are involved in hepatic gluconeogenesis (Figure 3A). In addition, treatment with PCPA for 3 days significantly increased expression of hepatic FGF21 (5.8-fold increase) and decreased expression of hepatic Nrf2 (35% decrease) while having no significant effects on expression of hepatic PPARα, PPARγ, and ATF4 (Figure 3B). Figure 3: Effects of intraperitoneal injection of PCPA (500 mg/kg) or 1% Tween in saline on expression of genes involved in hepatic gluconeogenesis (A) and expression of hepatic FGF21, PPARα, PPARγ, ATF4, and Nrf2 (B) in db/db mice. Data are presented as the mean ± SEM (n=6/group). *P<0.05. Although plasma FGF21 levels are reportedly elevated in obese rodents and human [2-5], the results of the present study demonstrated that plasma FGF21 levels and hepatic FGF21 expression were lower in obese and diabetic db/ db mice than normal C56BL6J mice matched for age. In addition, our results demonstrated that treatment with PCPA increased plasma FGF21 levels and expression of hepatic FGF21 in db/db mice. Moreover, our results demonstrated that treatment with PCPA decreased hyperglycemia independently of plasma insulin levels, and decreased hepatic gluconeogenesis via suppressing PGC1α and the downstream of Notch signaling [16-18] in db/db mice. From these findings, we raise a hypothesis that 5-HT might contribute to the decreases in plasma FGF21 levels and hepatic FGF21 expression, and the increases in blood glucose levels and hepatic gluconeogenesis in insulin-independent diabetic db/db mice. 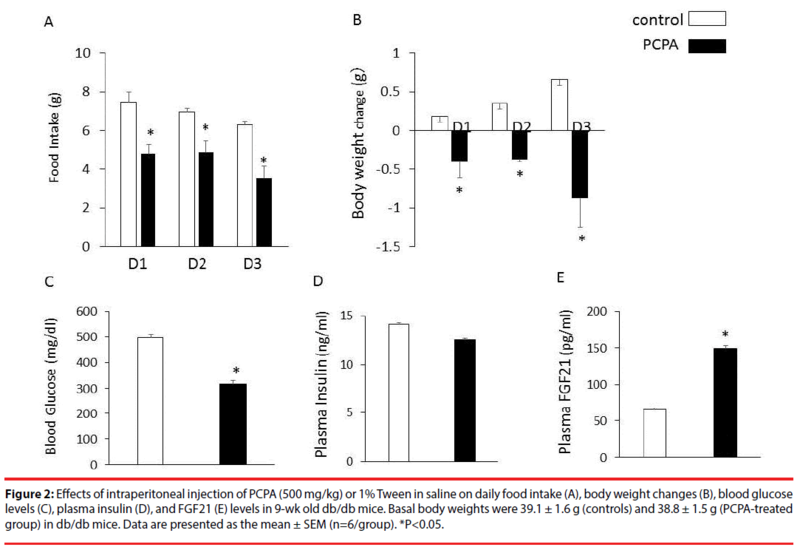 We have previously reported that treatment with PCPA for 3 days suppresses daily food intake, body weight gain and the increases in plasma FGF21 levels and insulin levels in C57BL6J mice fed a high-fat diet . Moreover, treatment with PCPA significantly increases expression of hepatic Nrf2 and decreases expression of hepatic FGF21 in mice fed a high-fat diet . Despite decreases in daily food intake and body weight, treatment with PCPA had different effects on plasma FGF21 levels and expression of hepatic FGF21 and Nrf2 in mice fed a high-fat diet and db/db mice. Thus, the different effect of PCPA on hepatic FGF21 production are independent of changes in daily food intake and body weight, and could be due to the differences in blood glucose levels and hepatic gluconeogenesis. Although mice fed a high-fat diet for 9 weeks display normal blood glucose levels , db/ db mice displayed remarkable hyperglycemia. Although plasma FGF21 levels and hepatic FGF21 expression are increased in obese mice fed a high-fat diet, they were decreased in diabetic db/db mice associated with increased hepatic gluconeogenesis. Thus, 5-HT could contribute to the pathophysiological mechanisms of diet induced obesity and type 2 diabetes in a different manner. Treatment with PCPA for 3 days remarkably decreases brain 5-HT and serum 5-HT levels in mice [11,12]. Although treatment with PCPA increases expression of hypothalamic 5-HT2C receptor and POMC, which may lead to feeding suppression , and increases energy expenditure via brown adipose tissues, which leads to weight loss , the present study demonstrated that changes in plasma FGF21 levels and hepatic FGF21 expression induced by treatment with PCPA were independent of decreases in food intake and body weight. Liver does not produce 5-HT and gut-derived 5-HT has substantially contributed to serum 5-HT levels. Gut-derived 5-HT may therefore contribute to the regulation of hepatic FGF21 production and gluconeogenesis in vivo. We, however, cannot completely rule out role of brain 5-HT in the regulation of hepatic FGF21 production and gluconeogenesis. In summary, these findings suggest that hepatic FGF21 production is decreased in db/db mice, and that a Tph inhibitor increases hepatic FGF21 production, and decreases hyperglycemia and hepatic gluconeogenesis in db/db mice. This work was supported by a Grant in-Aid for Scientific Research. Kharitonenkov A, DiMarchi R. FGF21 revolutions: recent advances illuminating FGF21 biology and medicinal properties. Trends. Endocrinol. Metab 26(11), 608-617 (2015). Markan KR, Naber MC, Ameka MK, et al. Circulating FGF21 is liver derived and enhances glucose uptake during refeeding and overfeeding. Diabetes63(12), 4057-4063 (2014). Fisher FM, Chui PC, Antonellis PJ, et al. A. Obesity is a fibroblast growth factor 21(FGF21)-resistant state. Diabetes 59(1), 2781-2789 (2010). Hale C, Chen MM, Stanislaus S, et al. Lack of overt FGF21 resistance in two mouse models of obesity and insulin resistance.Endocrinology153(1), 69-80 (2012). Zhang X, Yeung DC, Karpisek M, et al. Serum FGF21 levels are increased in obesity and are independently associated with the metabolic syndrome in humans.Diabetes57(5), 1246- 1253 (2008). Inagaki T, Dutchak P, Zhao G, et al. Endocrine regulation of the fasting response by PPARalpha-mediated induction of fibroblast growth factor 21. Cell. Metab 5(6), 415-425 (2007). Badman MK, Pissios P, Kennedy AR, et al. Hepatic fibroblast growth factor 21 is regulated by PPARα and is a key mediator of hepatic lipid metabolism in ketotic states. Cell. Metab 5(6), 426-437 (2007). Dutchak PA, Katafuchi T, Bookout AL, et al. Fibroblast growth factor-21 regulates PPARγ activity and the antidiabetic actions of thiazolidinediones. Cell 148(3), 556-567 (2012). Kim KH, Jeong YT, Kim SH, et al. Metformininduced inhibition of the mitochondrial respiratory chain increases FGF21 expression via ATF4 activation. Biochem. Biophys. Res. Commun 440(1), 76-81 (2013). Chartoumpekis DV, Ziros PG, Psyrogiannis AI, et al. Nrf2 represses FGF21 during longterm high fat diet-induced obesity in mice. Neuropsychiatry (London) 60(10) 2466-2473 (2011). Liu Y, Jiang Y, Si Y, et al. Molecular regulation of sexual preference revealed by genetic studies of 5-HT in the brains of male mice. Nature 472(7341), 95-99 (2011). Weng R, Shen S, Tian Y, et al. Metabolomics approach reveals integrated metabolic network associated with serotonin deficiency. Sci. Rep 5, 11864 (2015). Oh C-M, Namkung J, Go Y, et al. Regulation of systemic energy homeostasis by serotonin in adipose tissues. Nat. Commun 6, 6794 (2015). Nonogaki K, Hazama M, Satoh N. Liraglutide suppresses obesity and hyperglycemia associated with increases in hepatic fibroblast growth factor 21 production in KKAy mice, Biomed. Res. Int 751930, (2014). Nonogaki K, Yamazaki T, Murakami M, et al. Ingestion of eicosapentaenoic acid in the early stage of social isolation reduces a fibroblast growth factor 21 resistant state independently of body weig ht in KKA(y) mice. Biochem. Biophys. Res. Commun 464(2), 674-677 (2015). Diaz MB, Lemke U. Discovering orphans’ sweet secret: NR4A receptors and hepatic glucose production. Cell. Metab 4(5), 339- 340 (2006). Pajvani UB, Shawber CJ, Samuel VT, et al. Inhibition of Notch signaling ameliorates insulin resistance in a FoxO1-dependent manner. Nat. Med 17(8), 961-967 (2011). Czech MP. Obesity notched up fatty liver. Nat. Med 19(8), 969-971 (2013). Nonogaki K, Kaji T, Muarakami M. A tryptophan hydroxylase inhibitor decreases hepatic FGF21 expression and circulating FGF21 in mice fed a high-fat diet. Neuropsychiatry (London) 8(1), 372-377 (2018).